In 2014 I was honoured to work with Evil Hat Productions on a DrivethruRPG platinum-selling Fate World called „The Secrets of Cats„. In 2015 I Kickstarted a sequel book called „The Secrets of Cats: Animals & Threats“ and promised that a third and final book was in the pipeline that would be all about the magic of cats. This is a 12,500 word companion volume to the previous two books in this setting. It’s split into five chapters, each of which gives you more information about and options for feline magic. In Chapter 1, we discuss Knacks, the innate magic tricks some cats can perform outside the more rigorous schools of magic. In Chapter 2, we describe the Alchemy school of magic. This enables cats to ‚brew‘ potions in their throats and stomachs and then sick them up. When consumed or used as chemicals these potions can have incredible effects. In Chapter 3, we describe the Illusion school of magic. A school of cunning and trickery, master Illusionists can make you sense almost anything they want. In Chapter 4, we flesh out all of the other schools of magic with some new stunts. In Chapter 5, we reveal the amazing and powerful effects cats can achieve with Mingled Magic–stunts that use two or more schools of magic at the same time. Finally, in Chapter 6, we’ll delve deeper into the realm of forbidden magic, and talk about how cats who’ve sacrificed sapient beings and thus turned to evil can be redeemed. I’m delighted to announce that the one and only Crystal Frasier has agreed to set some time aside to work up more of her fabulously dark and whimsical art for this third and final book in the series. Josh Yearsley, my editor for The Secrets of Cats and The Secrets of Cats: Animals & Threats, is also on board to help me with my wordsmithing once more. 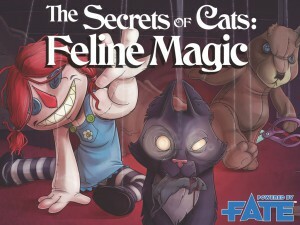 Der Beitrag The Secrets of Cats: Feline Magic – Crowdfunding erschien zuerst auf FateRpg.de.